You round a corner. You think you're in the clear but—oh no!—an enemy is standing guard. How will you ever bring him down without alerting other guards? Aha, your pistol has a silencer. One mouse squeak gun shot later and you're free. Except that's not how silencers work at all. This video from RagnarRox debunks the myth of silencers'—actually known as suppressors—magical power to completely muffle a device that produces tiny explosions. It's quite nicely detailed, too. Watch. Important points: a pistol can produce 160 decibels of noise. That's the whirring of a plane engine concentrated into a single, screaming ear-punch of sound. Snap a suppressor on that sucker, however, and you get... 126 decibels. That's still a whole lot of noise. We're talking chainsaw levels here. Suppressors, then, quiet down guns a little, but not enough to, say, let you meticulously pick off everybody in a cramped warehouse corridor weapons facility lava level. RagnarRox, however, makes a point I really like about why it's fine that most games—and movies and TV shows—get suppressors all wrong. There's a utility to it. We immediately know what they mean and, more or less, how they'll function without games having to explain it at length. Even if it is the gun equivalent of using the word "literally" to mean "figuratively," we're inundated with it. It's a thing that just makes immediate, unconscious sense. In entertainment (which many games are), that's great. It's helpful. It gets us into the action more quickly. That's interesting to me. 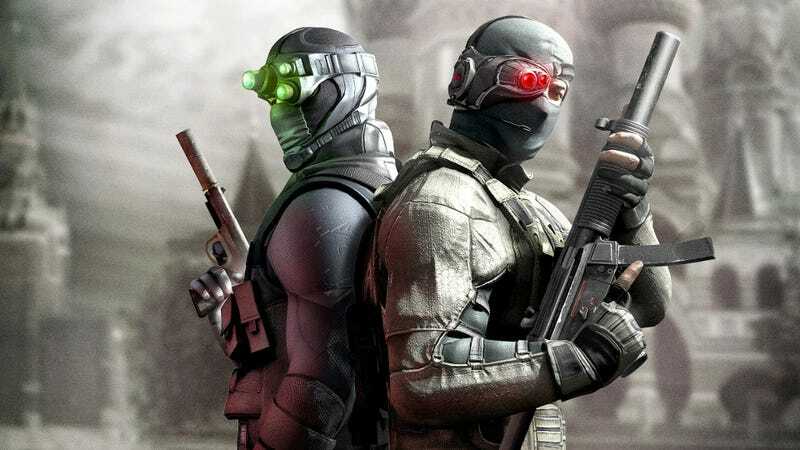 Games can infiltrate our brains—kinda like Sam Fisher with a magic sound obliterating tube screwed onto his gun—in ways we hardly even notice. Don't get me wrong: it's helpful to know how these things actually work in real life, but pervasive rule sets across games—and even large swathes of popular media—are powerful things. Little (and big) alterations that separate fact from fiction. And we just kinda... get them, for the most part. I'm not saying it's always good when everyone believes something works a certain way because games or Hollywood or whoever said so (in fact, it can be actively harmful), but it's food for thought. Can you think of any other things that have entirely different utilities in real life versus games? Any that are as pervasive as suppressors?